The resort is located in Loei province, Aumphur Dansai, 455 km northeast of Bangkok, Thailand and is 620 meters above the sea level. 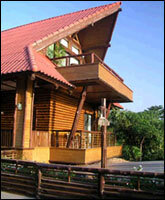 We offer a comfortable accommodation with beautiful sceneries and excellent facilities for travellers. Peaceful and Private with Beautiful Natural Surroundings. 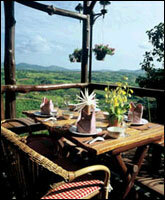 The perfect getaway place surrounded by various flowers and plants from cooler climate. It situates between scenic hills and lakes over 520 Acre of private land. 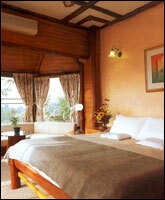 All of the rooms have been carefully designed with teakwood to blend with its surroundings. The rooms are also fully equiped with Satellite TV, Telephone, Air conditional, Refrigerator and mini bar. The resort has been designed to provide comfort and convenience so that guests can be assured of a truly relaxing and satisfying stay. Our Japanese’s style spa offers the natural feeling of nature’s hot spring, equipped with a solar heating and filtered-system. The essence of herbal and the warmth of our refreshing cleaned water will relax you. Together with our spa we offer a beautiful warm water swimming pool surrounded by nature and the view of the mountain ranges, the fitness room and opened view message room. Situated on top at the edge of the hill, our message rooms with a spectacular mountain’s view and cleaned mountain air will be an unforgettable experienced while you enjoy your massage. 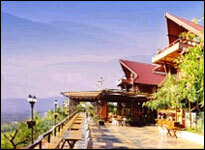 Rim Pha is our finest restaurant serving various Thai and International cuisine. All of our therapists have passed a training course at Dansai Crown Hospital (ISO9002) which standard controlled by the its Central Government Hospital. 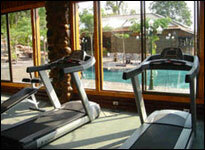 Within the resort area, we also provide many facilities for your indoor and out door activities during your stay. 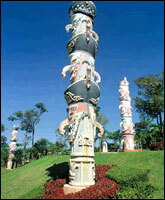 You can enjoy mountain bike, fishing, and canoeing during daytime and have fun with snooker in the night. There are a lot of interesting sides around Phu Pha Nam Resort such as Orchid farm, Orange farm, Muchroom farm and also Deer farm.